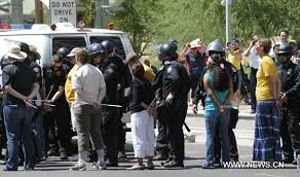 Immigration arrests are still a major issue in Arizona and the police and many citizens are on opposing sides of whether such arrests should continue and under what circumstances. Protesters and activists are becoming more vocal and leading demonstrations. Norlan Flores Prado was still wearing a hospital bracelet from his daughter's birth when U.S. Border Patrol agents who had been called by Tucson police arrested him on Sunday afternoon. Flores Prado was on his way to see his newborn when a Tucson police officer pulled him over for a traffic infraction. The officer asked him his immigration status after Flores Prado admitted he didn't have a driver's license, Tucson police say. He then admitted to being in the country illegally. Tucson police called the Border Patrol, who arrived within less than an hour. A network of activists whom Flores Prado had alerted also arrived on scene. Two women tried to stop the arrest by lying under a Border Patrol car, but they were dragged out by agents and arrested on charges of obstruction. The arrest was the second within the past few days, launching another protest Monday in front of the Tucson Police Department headquarters, where about 50 people holding signs chanted against what they call the "poli-migra." The Spanish term combines police with immigration authorities. "We're here because we demand that the police department in Tucson stop the racial profiling and stop the devastation of families," Isabel Garcia, of the Coalición de Derechos Humanos, said. The protesters called for the end of enforcement of SB1070, also known as the "show me your papers" law. The law requires local police to check the immigration status of people they encounter while enforcing other laws. Tucson Police Chief Roberto Villaseñor says that although he opposes the measure, he has no choice but to enforce it. "Once again, what I keep trying to get across to people, back in 2010, I predicted this is exactly the type of strife that this law will cause within a community. And this is one of the main reasons I was against this law and this statute," Villaseñor said. But he said calls for the end of immigration enforcement were unrealistic. "I enforce the laws. Whether I agree with them or not, I am duty bound to enforce the laws." Villaseñor says police officers have called the Border Patrol about 2,000 times since June 12. He says agents respond only about 1 percent of the time. The department began tracking those statistics electronically in June at the request of the ACLU of Arizona and the Tucson City Council. The policy change was modeled after an agreement between the city of South Tucson and the ACLU that aims to curb racial profiling. SB 1070 was signed into law by Gov. Jan Brewer in 2010 and has since been a source of contention between local law enforcement and immigrant rights groups.